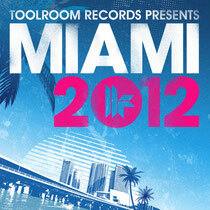 One of our favourite labels, Toolroom, presents 'Toolroom Records Miami 2012', its essential soundtrack to the biggest highlight in the dance music calendar, the Miami Winter Music Conference. Showcasing over 40 of the hottest tracks, including 25 new and exclusive offerings from label boss Mark Knight, Umek, Rene Amesz, Funkagenda, Alex Kenji, D.Ramirez, Dirty South, Joris Voorn, Nicole Moudaber & many more, its three full length DJ mixes reflect the different shades of house, blending the grooves and anthems alike to complete this top compilation. The Poolside Mix sets the mood with deep vibes courtesy of Sebastien Leger, Joris Voorn vs Moby and an awesome George Fitzgerald remix. Federico Scavo, Tiger Stripes and Sergio Fernandez provide exclusive grooves that lead perfectly towards the club. The Club Mix moves through the gears, with big room anthems from D.Ramirez, Marco Lys and Rene Amesz, as well as massive exclusives by Kim Fai, Mark Mendes and CaPa guaranteeing those hands in the air moments. The Afterclub Mix heads into tougher territory, with exclusive tech house monsters from Umek, Stefano Noferini and Wehbba mixed alongside dancefloor devastators by Nicole Moudaber, D-Formation and Alex Kenji. It’s released 26 February, so look out for it.